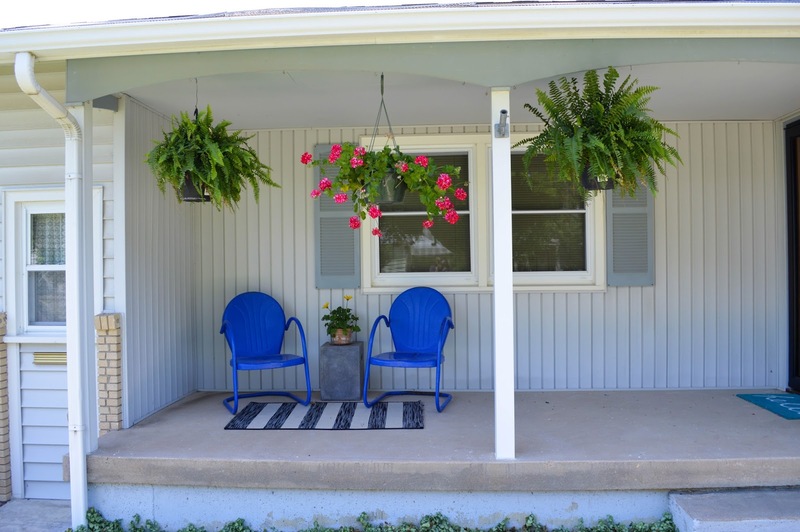 While I adored the porch on my old house, it lacked sunlight for plants. The level of sunshine on my new porch is much more attuned to plant growth, so this spring, adding hanging plants--two ferns, one geranium--was one of the first things I did to spruce up the new place. 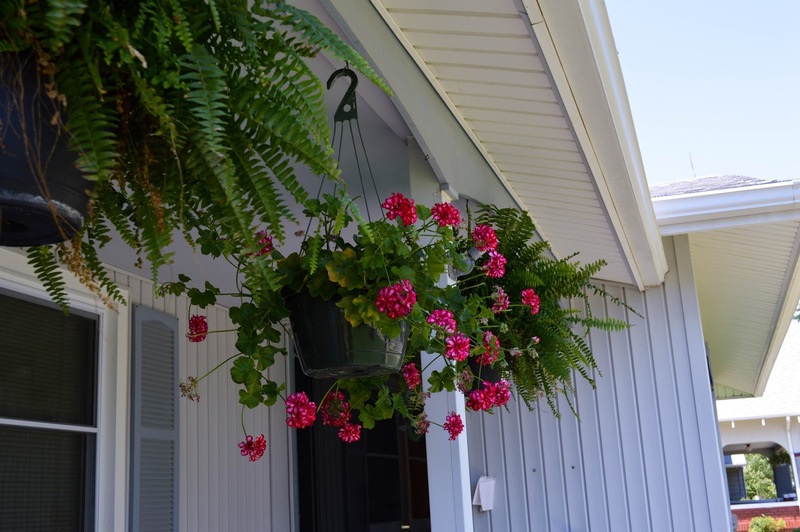 I have tended these plants in such a way as to inspire and encourage growth. Aren't they just so happy? From this angle, they look like they are all thriving, right? Nice, full, lush. Lovely. Things are a tad off-balance. The geranium and one fern are thriving. The guy by the drain pipe? Not so much. Its stunted growth is throwing off my porch symmetry! For weeks, a little mama (or papa)...I know less about birds than plants...has been in and out of the fern. A few days ago, we discovered this nest. 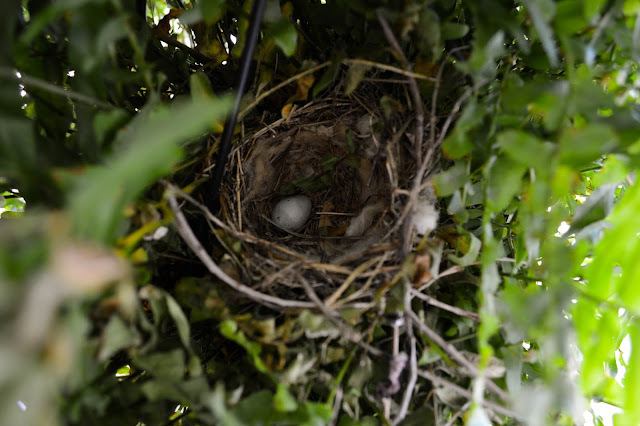 You wouldn't think that something as natural as a nest with an egg could be so destructive. The bird wasn't even big! But the activity happening inside was more than the fern could take. Sure, it's alive. But it definitely isn't thriving! As I pondered this, I realized that it is the perfect illustration of childhood trauma. It's easy to look at instances of trauma in children and think, "What's the big deal? It's just a small problem." But that small problem starts taking over. That small problem starts making a nest. That small problem lays eggs. That small problem manifests into something larger, until one day you realize that the trauma was a BIG deal. Like my fern, trauma kids stay alive. They may not be easy to spot from various angles. I guarantee most of my teachers would not have guessed my inner turmoil. I was an excellent student...good grades, good classroom behavior. In the outside realm, I kept my nest well-hidden. But there were many, many places where growth was stunted. It's difficult to BE a trauma kid, and it's difficult to PARENT a trauma kid. I know both difficulties. You never know how a trigger will make yourself or your child respond. You never know if rage will surface, or fear, or sadness, or a combination. And there is also a certain amount of fear that your rough road as a trauma victim or secondary-ptsd as a parent (YES, that IS a thing!) will be recognized among family, friends and peers as a burden worth helping to bear. Trauma experiences are real. Let's stop pretending hard things aren't hard. It's then that real growth can happen! You are endeavoring to be a facilitator of communication on difficult topics. My heart goes out to you, and you should be supported in prayer. Do have your prayer warriors circled around you. We have dealt with difficult issues over the years, and prayer and scripture, and love, and Christian counselors priceless in value. There is always HOPE for total healing in our Father's arms, by His breath, from the hem of His garment.